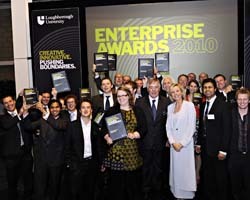 Loughborough University entrepreneurs whose work is making a difference in the world were last night (Wednesday 6 October) recognised at the 2010 Enterprise Awards, held at the University’s Science and Enterprise Park. Around 100 guests including many of the public and private sector organisations with whom the University works in partnership, together with academics and graduates, gathered for the annual awards, which recognise the impact of university research on society. The winners of the Student Enterprise category were Design and Technology graduates Laurence Kemball-Cook and Mark Wane. They created new business Pavegen from a university project, developing ingenious paving slabs that harness the power of footsteps to generate electricity for street lights, signs and electrical appliances. The winners in the Commercialisation category were Neil Dixon and Matthew Spriggs of the University’s Civil and Building Engineering department. Their Assessment of Landslides using Acoustic Real-time Monitoring Systems (ALARMS) offers the potential to save lives around the world and lessen the devastation to infrastructure. The winners in the Knowledge Transfer category were Christine Pasquire and Stephen Emmitt, also from Civil and Building Engineering. They worked to introduce lean construction techniques to Sandwood Design and Build Ltd, enabling the company to stay one step ahead of the competition in a challenging climate. Finally, the winners of the Consultancy category were Victoria Haines (Ergonomic and Safety Research Institute), Tracy Bhamra (Design and Technology), Kevin Lomas (Civil and Building Engineering) and Murray Thomson (Centre for Renewable Energy Systems Technology). This multi-disciplinary team worked together on an influential report on tackling domestic carbon emissions for the Department of Energy and Climate Change. Loughborough is one of the country’s leading universities, with an international reputation for research that matters, excellence in teaching, strong links with industry, and unrivalled achievement in sport and its underpinning academic disciplines. It was awarded the coveted Sunday Times University of the Year 2008-09 title, and is consistently ranked in the top twenty of UK universities in national newspaper league tables. In the 2010 National Student Survey, Loughborough was voted one of the top universities in the UK, and has topped the Times Higher Education league for the UK’s Best Student Experience every year since the poll's inception in 2006. In recognition of its contribution to the sector, the University has been awarded six Queen's Anniversary Prizes. Loughborough is also the UK’s premier university for sport. It has perhaps the best integrated sports development environment in the world and is home to some of the country’s leading coaches, sports scientists and support staff. It also has the country’s largest concentration of world-class training facilities across a wide range of sports. It is a member of the 1994 Group of 19 leading research-intensive universities. The Group was established in 1994 to promote excellence in university research and teaching. Each member undertakes diverse and high-quality research, while ensuring excellent levels of teaching and student experience.